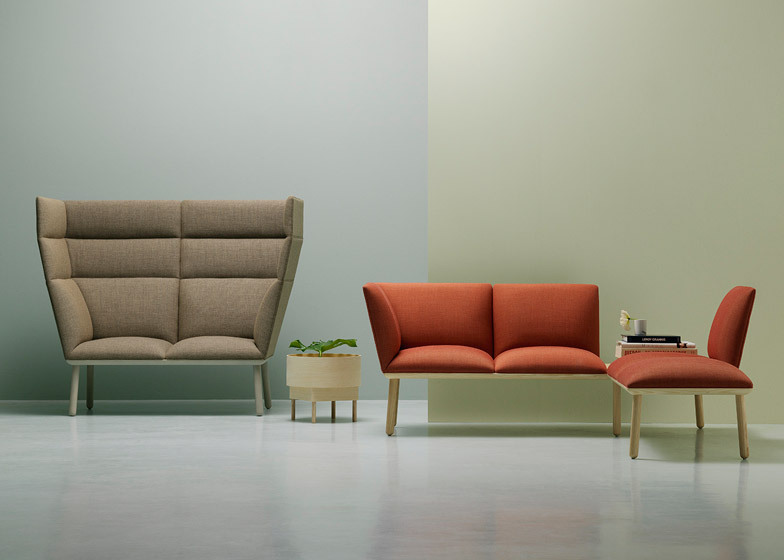 Swedish designer Stefan Borselius has created a modular sofa system for Fogia, based on the Tondo chairs he designed for the Swedish furniture brand last year. Stefan Borselius' Tondo sofa system comprises 55-centimetre square modules. These can be combined as individual stool seats or two- or three-seater sofas with adjoining tabletops and varying backrest heights. "I aimed for a sofa that works equally well in a public space as in a home environment," said Stefan Borselius, who described the design as "thin and yet soft, simple and yet characterful, light and yet robust, classic and yet playful". Borselius adapted the design from his series of chairs launched last year, which each featured a simple cushioned seat and back, with options for armrests and a head support. The new sofa system is made from an ash frame upholstered in multiple layers of foam and fabric in a range of colours, on top of round-footed ash legs. Variations on the basic module include angled backrests, small and large arms, and back supports high enough to act as room dividers. Different configurations enable everything from an intimate high-backed two-seater sofa for the home, to a low-backed multiple-seat sofa with integrated tables suitable for a waiting room. "Tondo is evolving from a single comfy chair into an entire sofa system for home and office," said a statement from Sweden-based Fogia. "The stark, exact lines envelop generous comfort. The classic shape is playful but neat, yet soft in design." "Its rectangular exterior implies architectural design, while the light and soft upholstery adapts to the body's longing for a sensuous cosiness," the brand added. The Tondo Sofa was launched at the Stockholm Furniture Fair last month, where Fogia also debuted a minimal furniture range by Andreas Engesvik and a compact lounge chair by Note Design Studio.